In Iowa Monday, President Obama criticized Republican vice presidential candidate Paul Ryan for being one of the "leaders of Congress" blocking a farm bill to help rural America from becoming law. "I am told that Gov. Romney's new running mate, Paul Ryan, might be around Iowa the next few days. 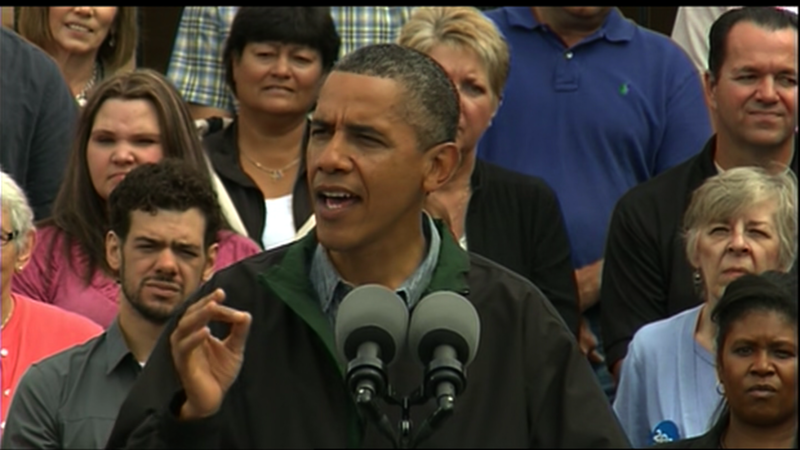 He is one of the leaders of Congress standing in the way," Mr. Obama said at a campaign rally in Council Bluffs. "So, if you happen to see Congressman Ryan, tell him how important this farm bill is to Iowa and our rural communities," Mr. Obama said. "We've got to put politics aside when it comes to doing the right thing for rural America." Mr. Obama called the bill the "best way" to respond to natural disasters and give farmers and ranchers "some long-term certainty." The Midwest is currently suffering a historic drought. Just days after Mitt Romney's ticket announcement, Ryan is also campaigning in Iowa, attending the State Fair on Monday. The president also announced that the federal government will purchase over $150 million in meat and fish in attempt to help the industry survive the drought. "That'll help ranchers who are going through tough times right now and also over the long term," he said. "That food is going to be spent by folks over at the pentagon and other places." Mr. Obama launched his first presidential campaign in Iowa in 2007, won the Iowa caucuses in 2008 and beat John McCain there by 10 points in the general election. This year however, it's going to be a harder hill for him to climb. It's a point Mr. Obama acknowledged in Council Bluffs, repeatedly telling the crowd, "I'm going to need your help." "If you vote for me in November, we will win Iowa, we will win this election, we'll finish what we started in 2008."